BLACKFIRE Gloss Enhancing Polish 2 oz. This finishing polish has a built-in glaze for the ultimate "wet-look"! BLACKFIRE Paint Cleaner visually reduces and removes swirl marks while creating a wet-look shine. It removes old waxes, sealants, and cleans the paint's surface to prep the surface for a shiny coat of wax or paint sealant. BLACKFIRE Paint Cleaner's formula is guaranteed body shop safe, allowing you to perfect the paint without any risks of fish-eyes. 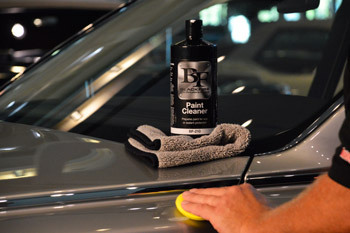 Used before your LSP (last step product), BLACKFIRE Paint Cleaner improves the gloss and clarity of the finish. Polishing is must for a show car finish! BLACKFIRE Paint Cleaner is a non-abrasive polish and glaze combination. Use BLACKFIRE Paint Cleaner to remove old wax, clean the top paint surface, visually reduce swirls and deepen the paint's gloss prior to wax or sealant application. It wets the surface to create the illusion of the paint being under water. BLACKFIRE Paint Cleaner helps hide minor swirls and scratches without removing any paint or clear coat. It "rounds-over" the leading edge of minor swirls which robs sunlight of a sharp edge to cause a reflection. While this visually reduces swirls, it does not remove them. This is a great product to use on a vehicle in good condition with very few swirls. 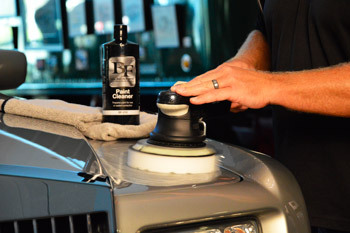 BLACKFIRE Paint Cleaner can be applied by hand or with a DA or orbital polisher. BLACKFIRE Paint Cleaner beautifies all colors of any paint with or without a clear coat finish. This polish can be used on single stage or conventional paint, base coat, clear coat finishes. It can also be used on nano, ceramic-particle clear coats or scratch resistant clear coats, but is not aggressive enough to hide minor swirls and scratches. BLACKFIRE Paint Cleaner is 100% VOC FREE! This makes the polish safer for your car's paint, safer for your skin and safer for the environment. BLACKFIRE Paint Cleaner will not weaken, dry or dull the paint with repeated use. This is cutting-edge polishing technology! Polish Comparison: BLACKFIRE Paint Cleaner is a combination finishing polish and glaze but is not designed to remove swirls, spots or paint defects. What this polish does do, in one step, is create the same liquid wetness that would normally require using a separate polish and glaze. A "glaze" is not required with this polish. It is built into the formula. Who should use this polish? BLACKFIRE Paint Cleaner is designed for newer vehicles or vehicles with a "like-new" finish. It is designed for enthusiasts and professionals desiring the deepest, wettest gloss. It's body shop safe formula allows professionals to apply it their customer's paint without having to worry about causing fish-eyes in the process! When used under BLACKFIRE Paint Sealant, it's pure magic! The combination of BLACKFIRE Paint Cleaner and Wet Diamond creates a liquid-like wetness that looks like you could reach into the finish. This combination is especially stunning on black, red and dark colors but still shimmers on white, grey and silver finishes. If you have a show car, concours car, hot rod or just want a show-car shine on your daily driver, use BLACKFIRE Paint Cleaner and follow with a top coat of Wet Diamond. Applies easily by hand or machine. BLACKFIRE Paint Cleaner wipes on and buffs off easily by hand. Apply a quarter size amount of product to a dry applicator pad and wipe on the surface using small circular motions. Apply to one section at a time (i.e. 1/2 hood, fender, etc.). Allow light film to dry. Buff residues with a clean Cobra MicrofiberTowel. If using a dual-action machine polisher like the Porter Cable 7424XP, apply with a polishing pad. Set the Porter Cable's speed control between 3-1/2 and 4. Buff off residues with a clean microfiber towel. BLACKFIRE Paint Cleaner 32 oz.